I love Andra style Chintapandu Pulihora for its tanginess and it is also an easy rice variety to prepare with basic ingredients at home. It is usually prepared for any festival or any happy occasions. 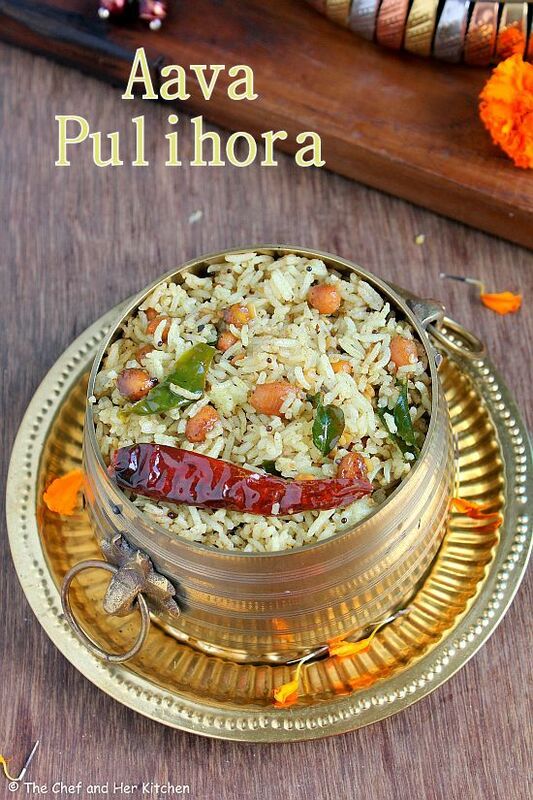 Today I am posting an Aava pettina Pulihora recipe which is a slight twist to the regular pulihora recipe but gives a new dimension to it. 'Aavalu' means mustard seeds in telugu and we are giving a mustard flavour to the traditional pulihora by adding the freshly pounded roasted mustard powder in this recipe and hence it is called 'Aava pettina Pulihora'. The preparation process is quite similar to the regular chintapandu pulihora but the mustard powder adds a new flavour to the usual pulihora. 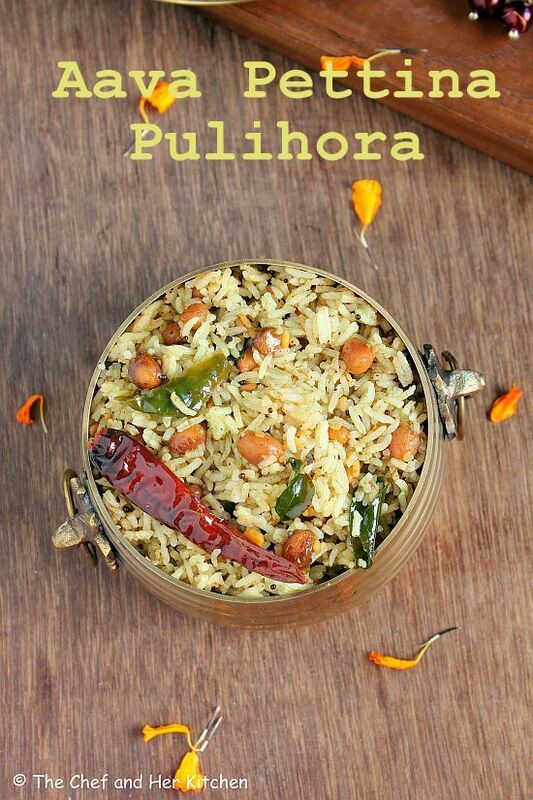 If you have not tried this Aava pettina pulihora you can try this recipe for a change from the usual rice variety. 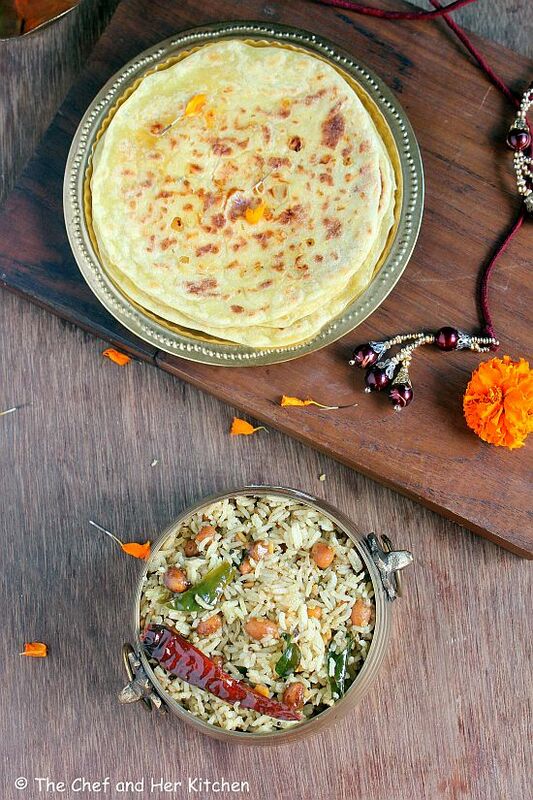 Try this Aava Pulihora along with Puran poli(Bobbatlu) for Vinayaka Chavithi festival as it is nearing by. If you are interested you can also check out my earlier post Aratikaya Aava pettina Kura (Raw Banana curry with mustard flavor). Soak tamarind in water for 15 mins and extract the pulp and keep it aside. Dry roast mustard seeds until they start popping and pound it into a fine powder using a pestle and mortar. You can even grind it in mixer but the pestle and mortar works efficiently here and adds a nice taste. Heat oil in a deep bottomed kadai/pan and crackle mustard seeds. Add chana dal, urad dal, red chillies and slit green chillies and fry until the chillies wilt and the dals turn light golden brown in color. Add curry leaves, sesame seeds, asafoetida, turmeric powder and fry half a minute. Add extracted tamarind pulp and jaggery and let it cook until it thickens and the oil separates from the edges. It takes 7-8 mins. Reserve some portion(2-3 tbsp) of the tamarind mixture we prepared now and add cooled and spread rice along with freshly ground fine mustard powder and salt and mix it nicely until everything is neatly incorporated. 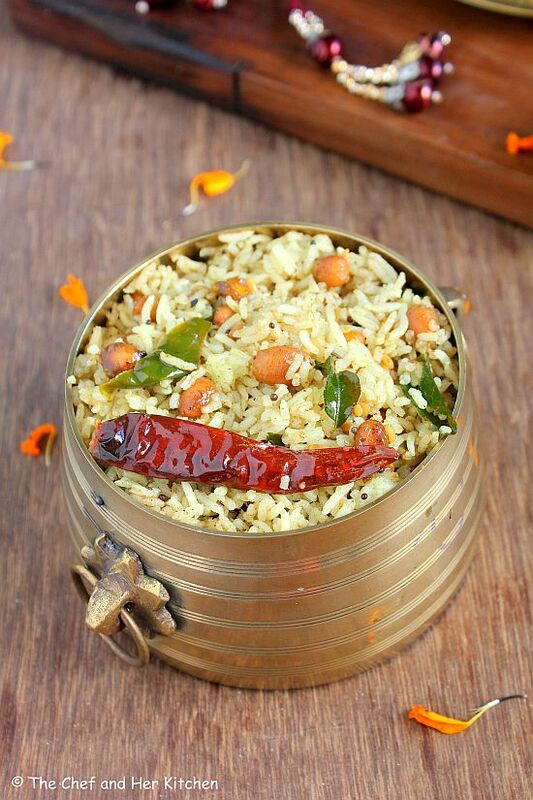 Now taste the rice and add more tamarind mixture or salt as needed and adjust the rice according to your taste buds. Prepare it slightly sour so that it tastes delicious once it is rested for some time. Rest it for an hour at least. Always make it bit tangy so that it will taste nice once it settles down.Do not add more mustard powder as it might give bitter taste. You can even mix the mustard powder with a tbsp. of lemon juice before adding to the rice. Also adjust the tamarind mixture accordingly. You can even add 1 tsp of chopped ginger in the tempering but I do not prefer to add it. You can cook the tamrind pulp separately until thick and do the seasoning separately and mix everything together - rice, thickened cooked tamarind pulp, seasoning, roasted mustard powder and salt until everything is mixed nicely.But I prefer to cook my seasoning in tamarind as it will enhance the taste of pulihora as the seasonings absorb the taste better when it is cooked in tamarind pulp. 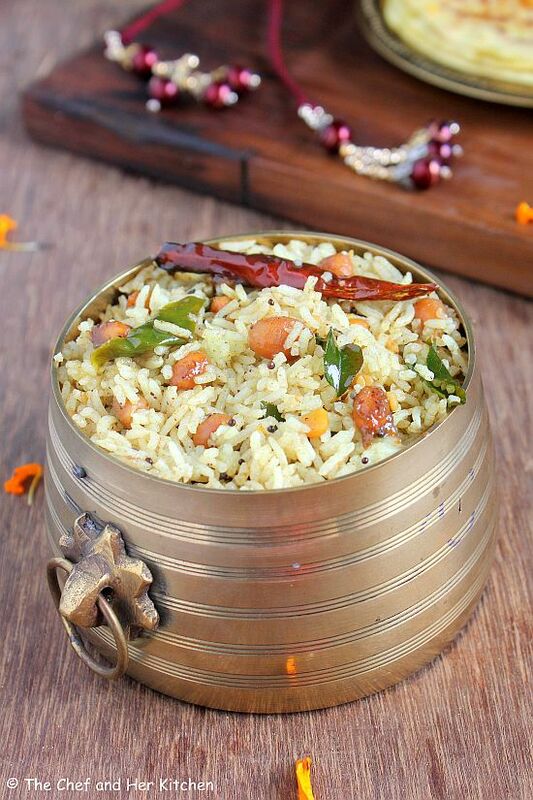 This rice is ideal to pack for travel as it does not get spoilt, you can keep it for long up to a day. Yours looks a little less dark.. What my mom used to make was darker. Maybe due to the kind of tamarind being used? Would love to have a bite of it. Love the pulihora here. My friend used to give me this rice whenever she would prepare it. Ah! miss those days from Singapore. Your pictures are tempting me so much that I might end up making them tonight :) Thanks for the recipe. So beautiful and very festive looking. I am ready for festival season. happy Ganesha! !